We offer customized Calibration model development service (SERVICE) for NIR-Spectroscopy. The service is reached via email and we deliver via email a link to a customized purchase page with the calibrations. The calibrations can be used to predict NIR-measured samples on the local computer by our free NIR-Predictor software. See details under NIR-Predictor. Bossart Analytics is a sole proprietorship. See also About. All prices are issued without valued added tax (VAT) / Rechnungssteller nicht Mehrwertsteuer (MWST) pflichtig. Payment by credit card are serviced by PayPal. See also Pricing. Please be aware that we do NOT offer refunds. No refund of calibration development cost. No refund of paid remaining time (annual usage fee). Unlike physical goods, electronically distributed digital goods can not be returned, because they can be copied. We offer calibrations with a trial time together with our free NIR-Predictor, so there is a possibility to try before you buy. Therefore, Bossart Analytics does not accept refunds, returns, or exchanges. Because the SERVICE is accessed by email communication on demand, users don’t need to do anything for termination or canceling the SERVICE. There is no setup fee and no registration needed. There is NO periodic withdrawals from your card. To request our SERVICE you need to have the free NIR-Predictor software installed on your target computer system, to have your personal request file ready. By sending your request file and your NIR-data (DATA) to our SERVICE, you confirm that the DATA is your property and you own the rights and intellectual property of the DATA. It is in your responsibility to use a secure data transfer (email, DropBox, OneDrive, etc.) for your DATA file (if needed). We provide the downloads from https:// secured site. We do not use, sell or give away your DATA, and it is deleted (30 days) after processing from our computers. You are responsible to backup your DATA by yourself. We accept your rights and intellectual property to the DATA and you accept our rights and intellectual property to the developed MODEL. The MODEL does not include a copy of your DATA. The MODEL it is a mathematical model to fulfill the prediction purpose. We guarantee to give away/sell/license the MODEL to you only, because it’s the MODEL customized for you. And there will be a (OEM) possibility that you can license the MODEL to others via our SERVICE. We do not use the MODEL ourself or predicting with it for others. The MODEL is stored in our online shop for 1 year after creation. This is not a backup copy, you are responsible to backup the purchased/downloaded MODEL by yourself. How the MODEL is designed, developed and built, is our intellectual property (IP) that is protected. Only you can use the licensed MODEL on your system with the NIR-Predictor software, because it is protected by Digital Right Management (DRM). 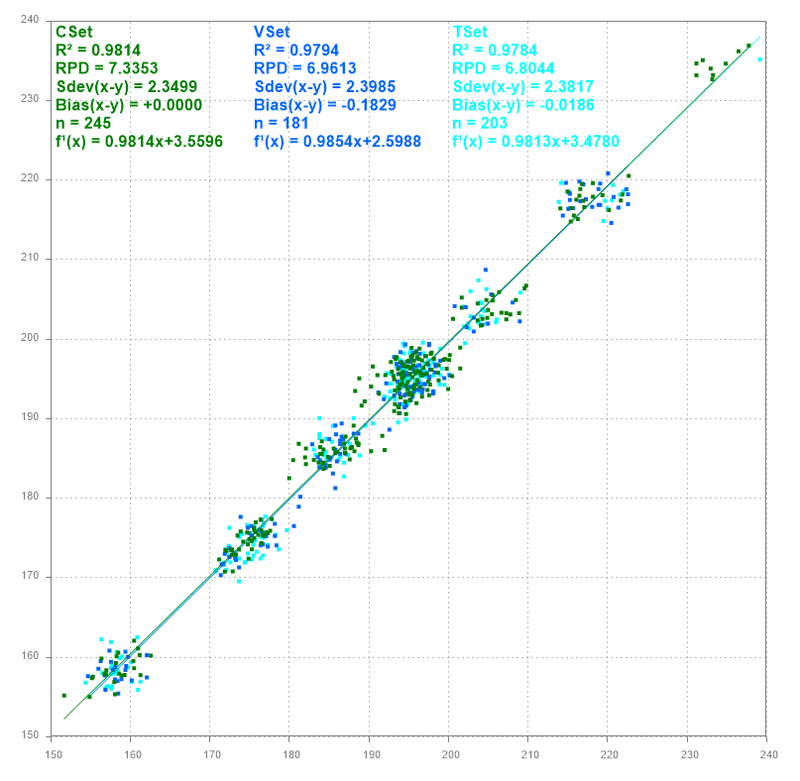 Together with the free NIR-Predictor software, you are able to test the MODEL locally on your computer with new measured data and can test and validate it’s function and performance. You shall use the SERVICE in compliance with all applicable laws and not for any unlawful purpose. We are allowed to reject and limit SERVICE requests, from users that obviously cheat our SERVICE with misuse of free trials, or seldom buy a customized model, that we have developed with effort for them on their request. The MODEL contains copyrighted material, trade secrets and other proprietary material. You shall not, and shall not attempt to, modify, reverse engineer, disassemble or decompile the MODEL. Nor can you create any derivative works or other works that are based upon or derived from the MODEL in whole or in part. The user must be aware of good practice in spectroscopy to measure good spectra and also good practice in the reference method. With poor data you will get poor results. The information provided by Bossart Analytics is provided “as is”, and for information purposes only. This means that Bossart Analytics does not offer any warranty whatsoever with regard to this service, its content, or any content or services accessible from the website. You agree that you are using the service at your own risk. We will not be liable or responsible in any way for any loss or corruption of Submissions, or for any costs or expenses associated with backing up or restoring any of your Submissions. We are not responsible for the accuracy, completeness, appropriateness, or legality of Submissions, results, analysis, computations, or any other information you may upload, store, receive, or access through or with the Services. You may not use the Services for any illegal, fraudulent, or unauthorized purpose. You are solely responsible for your conduct and any data, text, information, graphics, photos, profiles, audio clips, links, and other content (“Materials”) that you submit, upload, and display via the Services. Copyright © 2018 Bossart Analytics, Switzerland – CalibrationModel.com . All rights reserved.